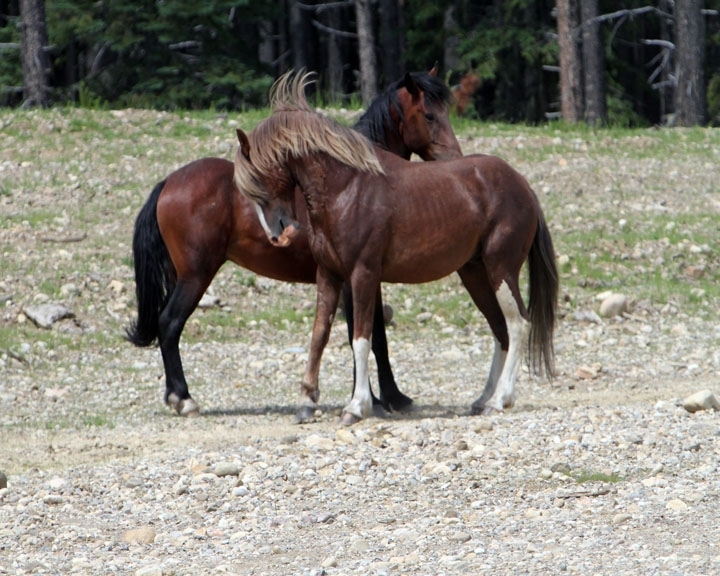 Monday, July 2 was a beautiful day, with sunny skies and warm temperatures we decided to visit Alberta’s wild horse country. 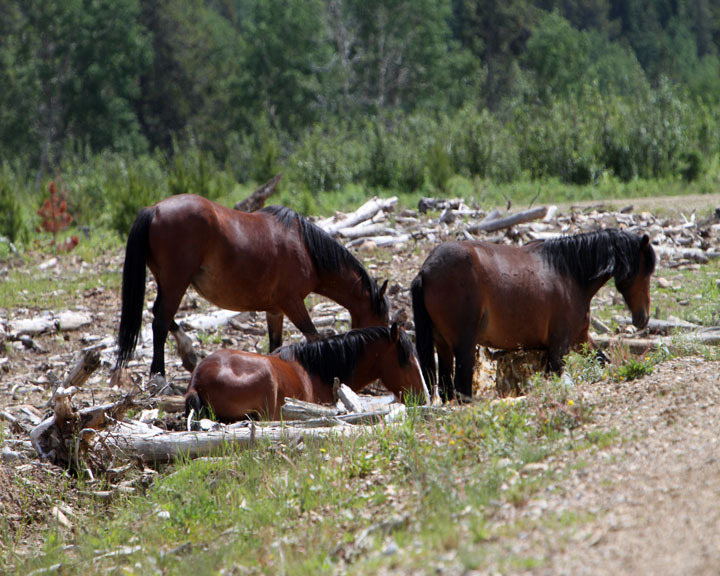 I knew of an area that I thought a few of the wild horses would be hanging around this time of year. This particular area has three natural mineral licks, several mud wallows, open areas for the wind to help keep the bugs off and plenty of forage for the wild horses. No sooner had we arrived into this area that we spotted the first herd. Excited because of the actions of the group and the new grulla colored foal, the picture taking started. Then we noticed we were surrounded by an amazing six different herds. Wow!!! With my Canon camera clicking away, I began to photograph all the different members of the various herds. 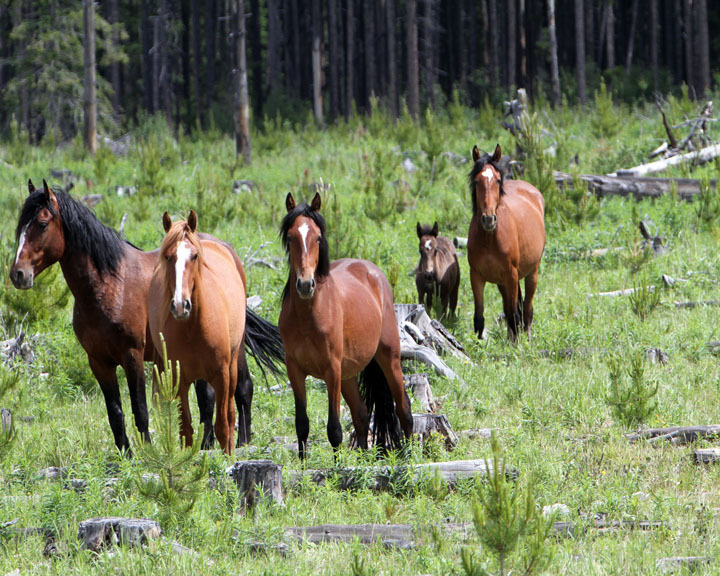 Each of these herds were watched over by a magnificent stallion. It was then that I noticed an old friend, a stallion that I call “Socks.” From just over a year ago when he was beaten, tattered and had lost his herd, here he was looking in fantastic condition with three mares and a new young foal. The scene, with so many horses in one close area was truly amazing and wonderful. 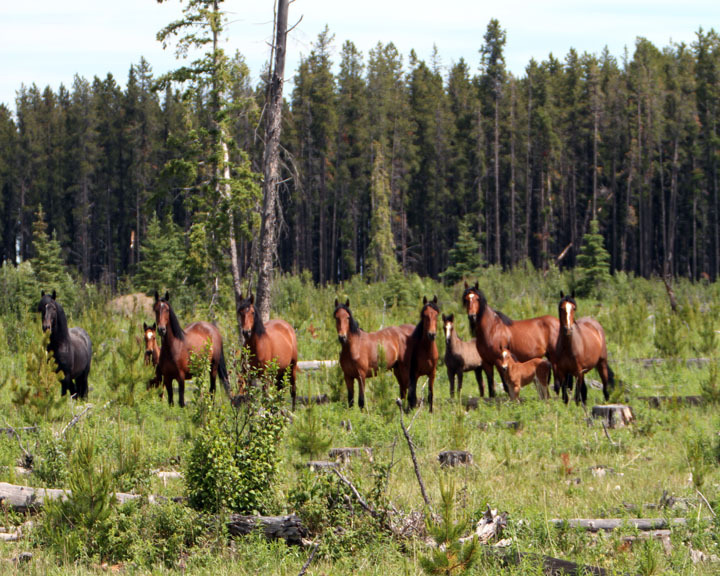 Everything was at peace and each stallion kept his particular herd at the tolerable distance from the other groups. This kind of activity between the herds only happens on very rare occasions and it was because of the amenities of this particular location that so many had gathered. Each herd was peacefully grazing or taking up minerals when out of the timber came two young studs. These two young boys were 3 to 4 years old and were willing to take up the challenge to start their own herds. What was amazing was of the different herds, Socks was the most mature of the stallions. For some reason this made his herd the centre of attention by these two boys. 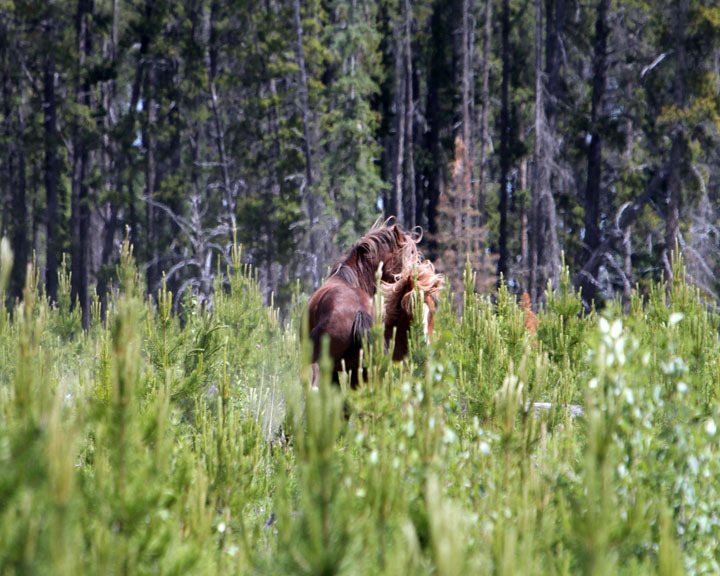 What we were about to witness still gets my heart excited and my wonderment and love for the wild horses growing. The most brazen of these 2 young boys, a light sorrel, covered in mud, made the first advances to challenge Socks. Having been through this many times before, it was almost instantaneous that Socks bolted from his herd and confronted the intruder. As is typical in these confrontations, a lot of posturing and squealing preceded some of the actions we were about to observe. This display is intriquing to watch and the sound can be heard for long distances as both stallions try to out do the other. My heart was with Socks. As this first confrontation took place, it was amazing to look around and see the other herd stallions standing with their herds, not excited, just watching. The young sorrel soon submitted to Socks’ superiority and retreated with no injuries. It was then that the second young stud decided to give it a try and approached the battle area. Socks was to have none of this and again immediately went after this bay stallion. This fight turned out to be quite a spectacle as Socks defended his small herd. Some of my photographs are wonderful in the animations of the fights. Then as we continued to watch this display we also noticed the young sorrel circling around behind this fight, moving toward Socks’ three mares and foal. Suddenly Socks whirled about and took off chasing the sorrel again. It was fantastic to watch my old friend almost be able to fly back to protect his herd again. He looked like he did when he was in his absolute prime. He was full of life again and this made my heart even soar even higher. Charging into the trees, the fight between the two really intensified. It was amazing to watch. Socks had had enough and at one point as the fight escalated, he grabbed the young sorrel by the back of the neck and actually threw him to the ground. The young boy this time gave up and he was chased off by the winner. When we last saw him he was walking slowly off into the trees, but basically except for his pride, he was uninjured. What happened to the bay stud? We then noticed that he had come too close to one of the other stallion’s herd. Not having any of this, this stallion began to chase off this boy. It was totally awesome to see the speed at which this chase took place. 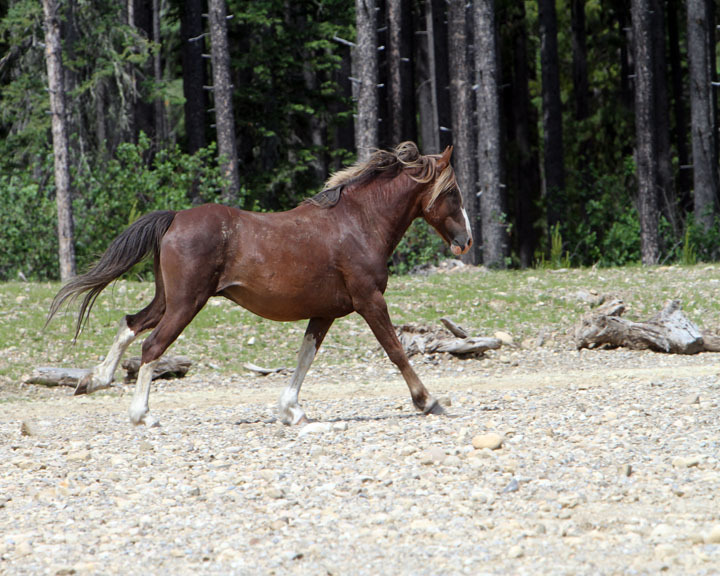 Through the debris of timber this mature stallion was at full gallop at points body fully stretched out and having all four feet off the ground. Wow!! Leaving this area and allowing the herds to go back grazing peacefully, we were yet to see a few more of these challenges occur with other herds we came across. Most of the time the scenes we came across were tranquil as the horses would sometimes be wallowing in the mud holes to protect themselves from biting insects who were driving us nuts too. Or they were standing in large open areas so the breezes would help. 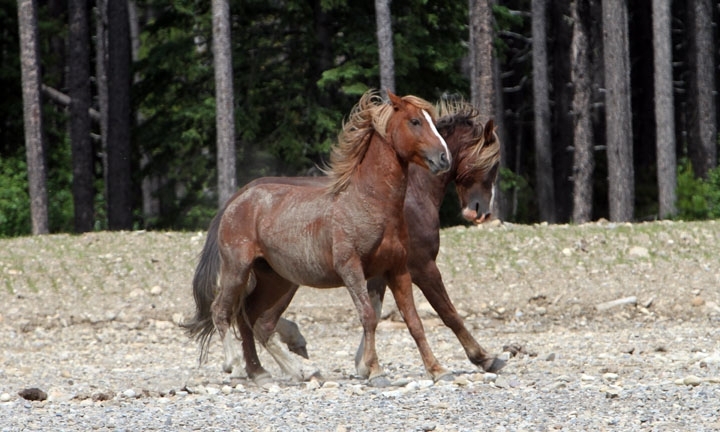 As in the above picture, the stallions are always at the ready to put themselves between perceived danger and their herd. I so love that about these beautiful, magnificent animals. 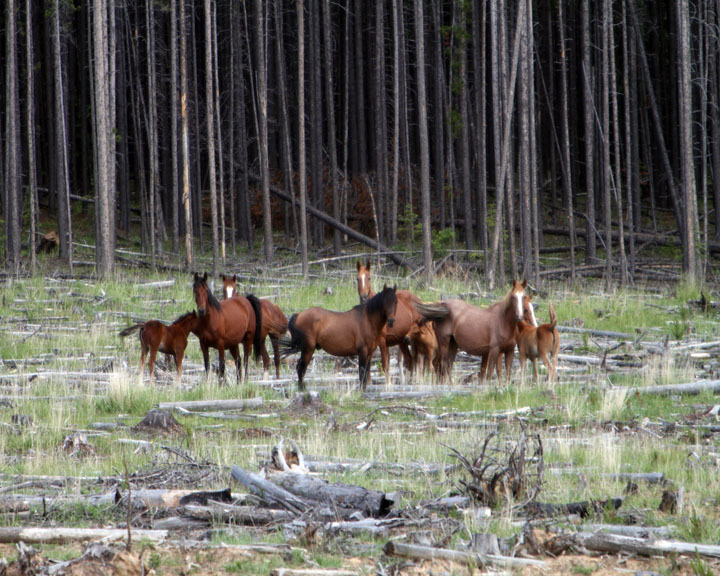 During our travels it was also great to see that the young foals we came across were all looking strong and healthy, even the newest ones. 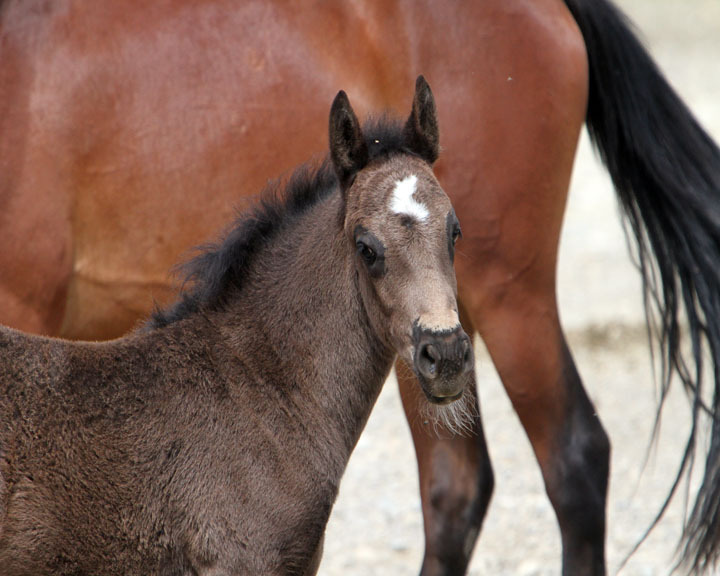 Here’s the foal featured in the last blog as a day old, now a month old. 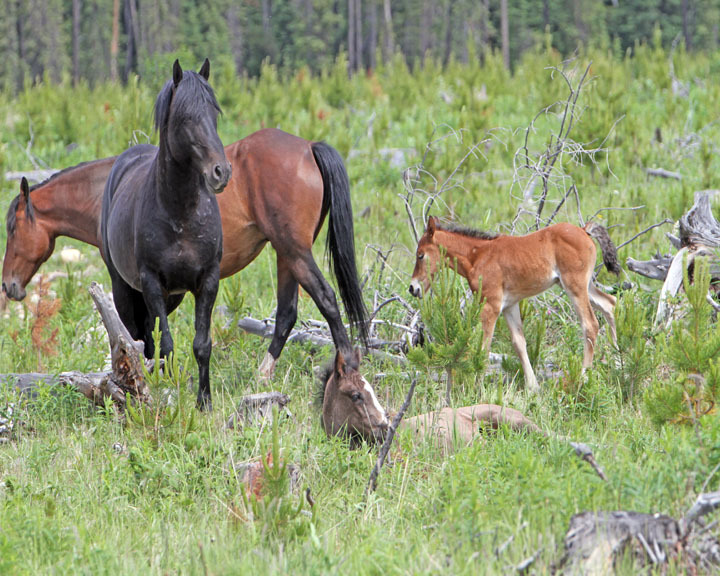 This is such a great time of year to be out riding our own horses and yet being able to visit with Alberta’s Wild Horses. 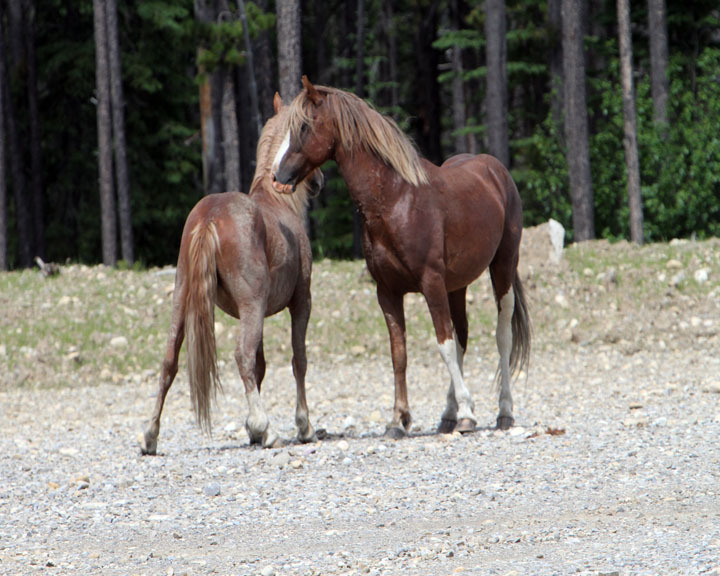 WHOAS will soon be posting news about our recent meeting we had with Alberta government officials and the direction and status that we are seeking to help protect your horses. Thank you.